Toilets | Huge range & the best prices online 5% discount? When nature calls, you want to use a toilet that offers great functionality but also delivers on the style front. From close coupled toilets to back to wall and wall hung toilets, you can be sure to find the perfect style for your bathroom in our extensive range. Many include a soft close seat for safety and extra added luxury. Every toilet we provide is built for durability and comfort. Quick and easy to install, our Close Coupled Toilets are ideal for smaller bathrooms and come with a 10 year 'Fit and Forget' guarantee. ###H2###Toilets for Sale###/H2######BR### A toilet is the heart of the bathroom, it helps create a stylish space and really brings the whole room together. In order to really add value to your space, not only do you need your toilet to offer great functionality, you also need it to be stylish. From classic close coupled toilets to designer wall hung and modern back to wall toilets, Bathroom Takeaway offer an extensive range to complement your bathroom suite. 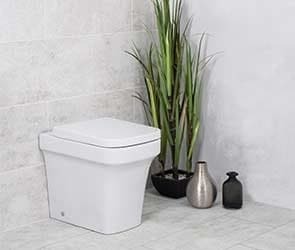 ###BR######BR### All of our toilets are produced from a hard-wearing and durable white vitreous ceramic, to not only ensure the toilet will last for years, but to also make sure they are as stylish as possible and feature a glossy finish. The majority of our toilets also include a soft close seat, adding extra safety and an added luxury. ###BR######BR### We know that redesigning a bathroom can be expensive, that's why we offer everyday low prices. With our range of toilets starting from as little as £59.97, there is something for every budget. Quick and easy to install, our toilets also come with a 10 year ‘Fit & Forget’ guarantee. ###BR######BR### ###H3###Choosing a toilet###/H3### Choosing a toilet can be a difficult task when there is so much choice on the market. Your toilet has to fit flawlessly into your bathroom and therefore the right design is crucial. 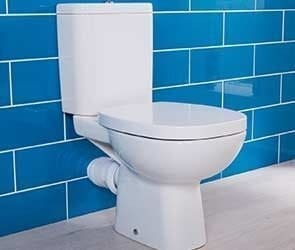 At Bathroom Takeaway, our range of toilets includes: wall hung, close coupled, back to wall and concealed toilets. ###BR######BR### Close coupled toilets are the most common type of toilet. The cistern connects to the pan creating a streamlined design. The range of close coupled toilets at Bathroom Takeaway are available in a range of styles, to suit any bathroom design. Whilst we have a large range of sleek, modern toilets, perfect for a contemporary style bathroom, there are also a range of intricately designed close coupled toilets, with tongue and groove panelling and a curved design to fit with a traditional Victorian bathroom. Our range of close coupled toilets start from as little as £59.97, offering a simple but timeless style, at an attractive price. They are produced from white ceramic for a long-wearing, stunning look. Our close coupled toilets feature a clever design and also offer a soft close seat. ###BR######BR### Wall hung toilets are a modern toilet that fit perfect in a bathroom that features a minimalist design. The wall hung style means the pipework is fitted behind the wall and therefore helps to save space, fitting perfectly in a smaller bathroom or cloakroom. Wall hung toilets from Bathroom Takeaway are extremely modern and deliver the perfect look for your bathroom. The stylish design adds a sense of luxury to your bathroom suite and with so many styles to choose from, you are sure to find the perfect toilet for your space. 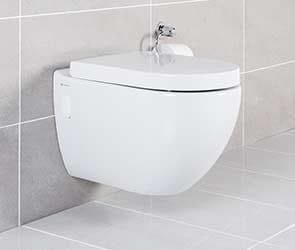 Starting from as little as £79.97, there is a wall hung toilet to suit any budget. 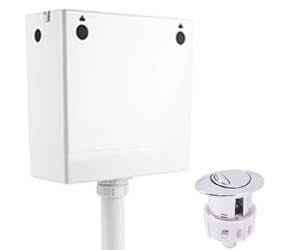 ###BR######BR### At Bathroom Takeaway, we also have a range of fittings for a wall hung or concealed toilet system. 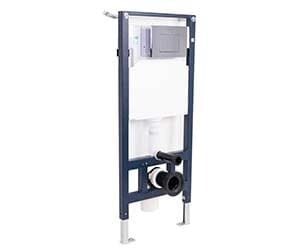 The fittings include replacement wall hung toilet frames and concealed cisterns. These fittings are all part of creating the perfect wall hung or back to wall toilet, offering a simplistic and minimalistic design. 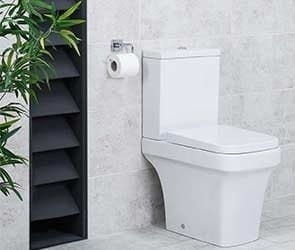 Both the wall hung toilet frames and concealed cisterns need to be fitted behind the wall or tiling features in order to create the perfect wall hung or back to wall toilet. All of our replacement parts are easy to fit, extremely safe and strong, so you can be sure once they have been fitted, they will last for years to come. All of the fittings help towards creating the perfect bathroom space and come at a reasonable price. ###BR######BR### For compact bathrooms, there are smaller options such as back to wall toilets. They are perfect for small bathrooms or cloakrooms thanks to their concealed pipework. The toilets are extremely minimalist so can fit perfectly in any style bathroom. The soft edges and white high varnish finish will fit perfectly with any colour scheme, in a traditional or modern bathroom. At Bathroom Takeaway, we also have a range of back to wall units, in a stylish and neutral light grey, to fit ideally with your contemporary style bathroom. ###BR######BR### If you wish to create an integrated design in your bathroom, we offer a range of suites and combination units. The suites available at Bathroom Takeaway comprise of at least a toilet and basin and usually include a bath, while the combination units include a toilet, basin and vanity unit. The combination units are ideal for use where space is limited and they provide a full solution for the cloakroom or a small bathroom. The bathroom suites are the ideal option for a family bathroom and create a unified style. ###BR######BR### ###H3###Quality Guarantee###/H3### Bathroom Takeaway is committed to offering customers the highest quality products, which is exactly why we offer a 10 year ‘Fit & Forget’ guarantee. 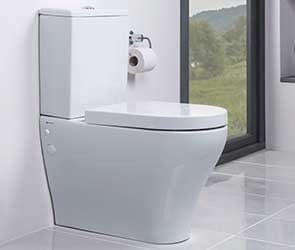 Produced from highly durable vitreous ceramic, all of our toilets are built to last for years to come. If you aren’t happy with your products, we also offer a 30-day money back guarantee, so you know you have peace of mind in case your product isn’t quite right and doesn’t fit your requirements. ###BR######BR### As well as a 10-year guarantee, Bathroom Takeaway also promises to offer everyday low prices. This means that you don’t have to wait for a seasonal sale to get the products of your dreams, you will receive the best price every day of the year. All customers are also eligible for free delivery when you spend over £349.